Kennedy’s Flowers & Gifts, Grand Rapids, Michigan, has been selected as the Michigan Floral Association Retailer of the Year. The announcement was made at the annual Great Lakes Floral Expo. The shop, founded in the 1940s, was cited for its high standards and professionalism not only in the industry but also in their community. 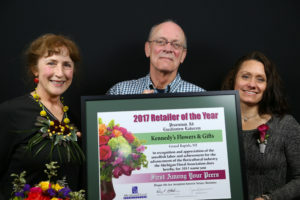 Current owners, Lori and Jack Haveman have worked in the floral industry for 75 combined years, and have owned the shop for the last 33. Lori is the United States president of the World Flower Council, which promotes world peace through flowers. They also are the official florist for the Grand Rapids Ballet and the Grand Rapids Civic Theatre. Each year the MFA Awards and Nominations Committee is responsible for soliciting and reviewing award nominations. The committee sends all qualified nominations to a panel of independent judges who complete an evaluation form for each nominee. The committee totals the points received for each candidate nominated in a specific category and averages. The candidate receiving the highest average score in each category is chosen to receive the award.